Some said that Pieter de Hooch, a Dutch Old Master genre painter was the son of a butcher, while other biographers said that he was the son of a bricklayer and a midwife. 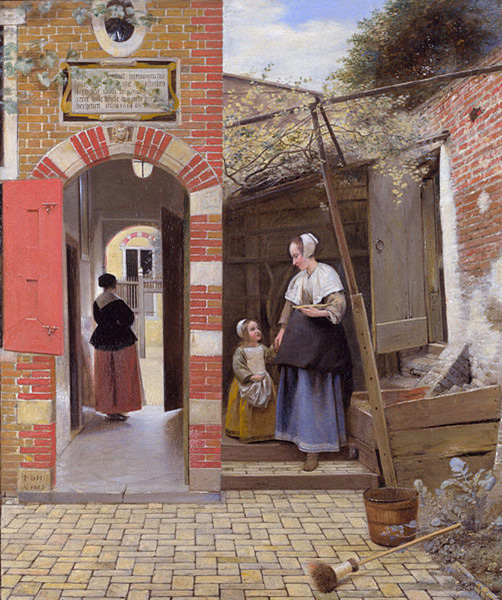 Nevertheless, what is clear was that Pieter de Hooch came from a humble family. De Hooch, as a genre painter, made a distinction for himself by his skill in the use of light and his thought-provoking interior scenes. Many of his best works were created during the early part of his career while he was still in Delft, which, at that time was one of Netherlands’ most lively art centers. His paintings usually showed middle-class families in sunny courtyards or in ordinary or simple interiors, going about their normal daily routine. The paintings usually showed a calm environment, wherein the only disruption is the radiance of natural light coming from either a window or a door. The exact date of birth of Pieter de Hooch is unknown, but he was born in Rotterdam and baptized on December 20, 1629. He served his initial apprenticeship in his native city under Ludolph de Jongh before studying in Haarlem under Nicolaes Pietersz Berchem. It was known that he was an independent painter and was a member of the Delft Guild of Saint Luke in 1655. It was also known that he had a second job, like many of the artists during that period. He worked as a servant and painter starting in 1650 for Justus de la Grange of Rotterdam, who was an art collector and a linen merchant. Due to his work, he traveled with the merchant to Delft, Leiden and The Hague, which allowed him to see paintings of several artists, including Nicolaes Maes, a Dutch Golden Age genre and portrait painter and Gabriël Metsu, a 17th century Dutch painter known for his portraits, still lifes and exquisite genre and history paintings. It was assumed that most of his works during that period were given to the merchant in exchange for room and board, as it was later known that 11 paintings of De Hooch were in La Grange’s possession. Later, De Hooch decided to move to Delft. In 1661, the artist relocated to Amsterdam. In this period of his career, his style became more exuberant and elegant, but still maintained his favorite theme – interiors illuminated by natural light coming from a window or a door, and each one with a moral message to convey. Johannes or Jan Vermeer was a contemporary of Pieter De Hooch. Both painters created thematic paintings, specializing in domestic interior scenes. Both artists were also known for their skillful utilization of available natural light. It was said that Pieter de Hooch was influenced by Vermeer, who was slightly older than De Hooch, but other art historians thought otherwise. In the balance of a painting’s interest, Jan Vermeer preferred persons while Pieter de Hooch preferred to focus on things. The two artists were the same in some ways, as they both used several quadrilaterals in their compositions of interiors, as well as carefully selected the source of light. But in the works of De Hooch, the figure is not the central point in the painting. He used the figure to provide a contrast, a curvy image that broke the monotony of the basically rectangular pattern of a room and the inanimate things within. De Hooch showed no preconceptions when creating his interiors. He depicted the lighting and the colors as he saw them, whereas Vermeer hated dark shadows and had a preference for the tonalities of yellow and blue. The influence of the works of Rembrandt, which showed in some of Vermeer’s paintings, was forever seen in the works of De Hooch. 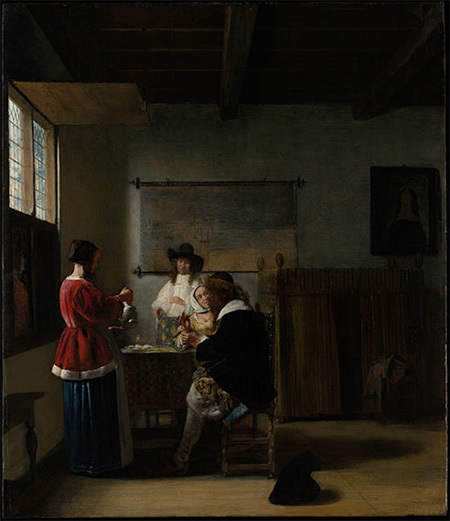 While De Hooch might have lacked formal art training, his secondary work as a house servant was presumed to have taught him to be keenly observant of home interiors. He developed a sense of pride and a very intimate feeling for a fine house, which he depicted with intricate delicacy in his paintings. Each item within a room was carefully chosen, such as a chair, the floor tiles, the position of the figures, the various textures and the vivid yet quiet play of light that comes in from usually a single source. Today, most of Pieter de Hooch’s paintings are in different art galleries across Europe and the United States and several others belong to private art collectors.